THE US government is again hurtling towards shutdown after Donald Trump called for the "nuclear option" in a barrage of tweets. The President said the closure of vital agencies would "last for a very long time", warning: "Shutdown today if Democrats do not vote for Border Security!" 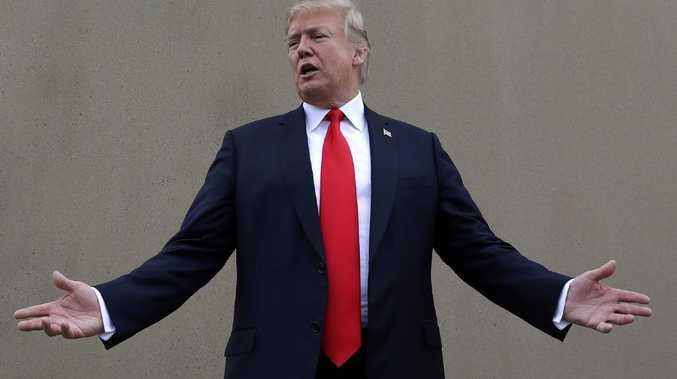 Mr Trump had appeared to reverse his hardline position earlier this week, when White House Press Secretary Sarah Sanders said the administration did not want to close the government and would "look at other ways" to get the $US5 billion ($A7 billion) for the wall. 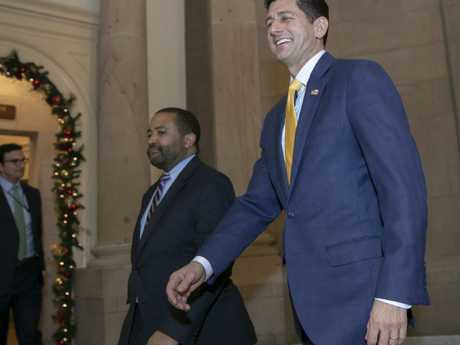 By Thursday afternoon all bets were off, and the President called Republican leaders from the House of Representatives to the White House, ordering them to push through a funding bill that included the figure. Now, the shutdown could now be just hours away, with Mr Trump insisting the potential closure at midnight Eastern Time would be the Democrats' responsibility. 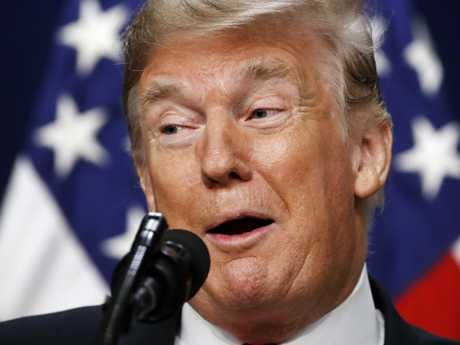 The majority-GOP House approved Mr Trump's funding bill as directed, but Democratic Senators have vowed to block it, with the party only willing to approve $US1.3 billion ($A1.8 billion) for border security. "We will get it done, one way or the other!" Mr Trump tweeted on Friday morning. "The Democrats now own the shutdown!" But Senate Democratic Leader Chuck Schumer hit back: "The Senate UNANIMOUSLY passed a bipartisan solution to avoid a shutdown. Then you threw another temper tantrum and convinced the House to ignore that compromise." If the funding bill is not approved in the Senate, the US government will face partial shutdown, with nine of 15 agencies closing, leaving the nation in turmoil. Famous sites such as the Statue of Liberty could close, travellers may face severe delays and government workers will be placed on leave without pay or have to wait for their wages. The scenario could cost the US economy billions of dollars. Mr Trump was resolute in the face of impending chaos. "People don't want Open Borders and Crime!" he tweeted. He claimed there was "nothing else's (sic) that will work" to fix immigration issues in the US other than a wall along the southern border with Mexico. He compared his wall to the wheel, insisting "there is nothing better" and that he "knows tech better than anyone". Mr Trump told reporters at a bill signing the chances of a shutdown were now "probably pretty good", according to CNN. "It's really up to the Democrats," he said. 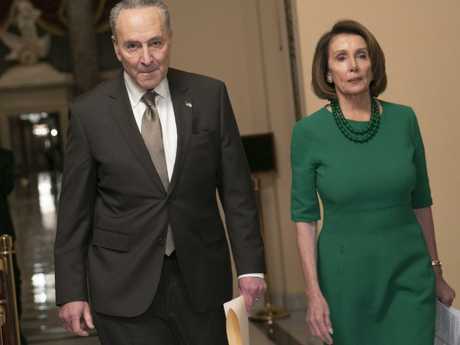 "Totally up to the Democrats as to whether or not we have the shutdown. "It's possible we will have a shutdown. I would say the chances are probably very good because I don't think Democrats care so much about this issue." While the Republicans have a slim majority in the Senate, 60 votes out of 100 are needed to approve legislation, meaning the party needs to find support from some Democrats. The "nuclear option" is a procedure that allows the Senate to override this and end a debate with a simple majority of 51 votes. Ms Sanders said Mr Trump would "love" House Majority Leader Mitch McConnell to lower the threshold. He tweeted: "Mitch, use the Nuclear Option and get it done! Our Country is counting on you!" Mr McConnell has not previously seemed open to raising the option, but overnight urged senators to "not end the year the way we began" with a shutdown over immigration. "Let's pass it and let's finish our work for this year," he said. "Let's secure our country." The wall has long been Mr Trump's signature promise, and one he sees as vital to winning reelection in 2020. Last week, he claimed he would be "proud" to shut down the government if Congress did not approve his funding. During a public spat with Democrat leaders in a televised Oval Office meeting, Mr Trump said he would "wear the mantle" if a shutdown took place. But by Friday, he had changed his tune, and was ready to blame the other side. "If enough Dems don't vote, it will be a Democrat Shutdown!" he tweeted. It unleashed a war of words between the two sides, with Mr Schumer telling reporters late on Thursday: "The bill that's on the floor of the House, everyone knows will not pass the Senate." Kevin McCarthy, leader of Republican politicians in the House, said: "Chuck Schumer and Senate Democrats now have to decide whether it is worth shutting down the government to keep us from securing our border." Some senators blamed a "hissy fit" thrown by conservative radio hosts for the country's nightmare position. "I am astonished. We had a deal ... and then because Rush Limbaugh had a hissy fit we're back here today," said Senator Joe Donnelly, according to BuzzFeed. Ms Sanders had indicated a reversal on Tuesday, saying the administration did not want a shutdown and would look at "other ways to get to" the $US5 billion ($A7 billion) Mr Trump wants to build his wall. There was discussion of using defence money to fund it. But Mr Trump ignored many advisers by backing away from a stopgap bill without the wall money that would have averted the looming closures. The Senate is being called back to session to consider the package approved by the House, but is expected to reject it. The White House cancelled Mr Trump's planned trip to his Mar-a-Lago resort in Florida on Friday afternoon, according to an internal email seen by Politico. That suggests a shutdown is looking increasingly likely, and he will remain in Washington to try to thrash out an agreement that works for both sides. Congress is staring down the barrel of its third shutdown in two years, with funding not yet agreed for nine of 15 government agencies - including NASA and the Food and Drug Administration. More than 800,000 federal workers will be affected, with the departments of commerce, justice, agriculture, homeland security and national parks forced to close. Workers not classified as essential to public safety at the unfunded agencies would be put on temporary leave and none would be paid until the matter is resolved. Three-quarters of government programs are fully funded up to next October, including those carried out by the defence, labour, veterans affairs and health and human services departments.